Researchers of the Max Planck Institute for Polymer Research have investigated friction of liquid droplets on surfaces. A larger force is needed to set in motion stationary droplets than to keep moving droplets in motion. This behavior is already known for solids on surfaces. For the case of liquids, the phenomenon has been elucidated just now. Imagine being in the car and driving on the highway. Suddenly, it starts raining. On this occasion, did you ever look at the raindrops on your windshield? Probably you noticed that the raindrops changed their shapes and mobility depending on the speed. If you keep your speed down, the raindrops stay put on the windshield. If you drive faster, the raindrops start moving across the windshield. Taking a closer look, you notice that the shape of the raindrops is changing. The static oblong droplets become increasingly round when they slide across the windshield. 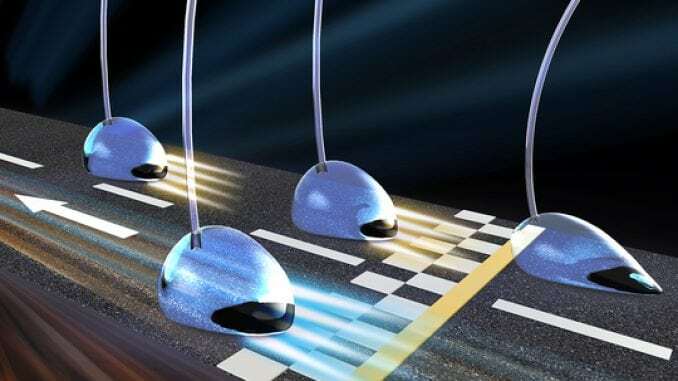 A team of scientists at the Max Planck Institute has investigated which forces are necessary to set liquid droplets in motion and which forces are necessary to keep them in motion. Hint: Only the front-seat passenger should make these observations. 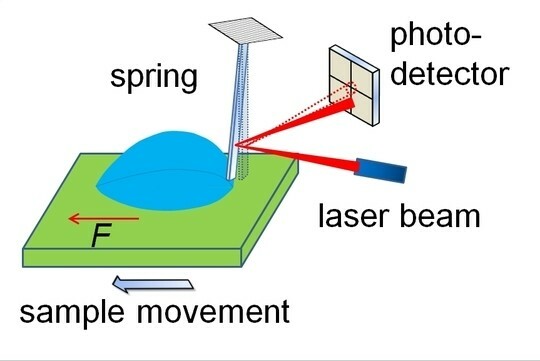 A special measurement instrument has been developed to investigate the friction forces between a liquid droplet and a solid substrate. The end of a thin glass pen sticks in the droplet resting on the substrate. If the substrate is moved sideways, i.e. laterally, the glass pen is bent. This deflection is determined with the help of a laser beam and a light-sensitive detector. The friction force, which is responsible for the motion of the substrate with respect to the droplet, is calculated via the spring constant and the deflection of the glass pen. We filmed and tracked the shape of the droplet with two high-speed cameras to measure the shapes and contact angles of the liquid droplets simultaneously. This setup allows elucidating the development over time of the friction force in the transition of the droplet from the stationary to the sliding state. It is characteristic that a threshold force needs to be overcome to set the liquid droplet in motion. Analogous to the case of friction between two solids, static and sliding friction can be distinguished: the realm of continuously increasing static friction to a maximum static fiction and the realm of the long-term stationary rolling and sliding friction. In contrast to solids, rolling and sliding friction cannot be distinguished conclusively in the case of droplets. Rolling droplets can also slide simultaneously. The interplay of rolling and sliding friction originates from the mobility of the molecules within the droplet. Dependent on the chemical composition of the surface and its microstructure the difference between rolling and sliding friction differs. For instance, if the surfaces are flat and chemically similar to the liquid, there is only a minimal difference between the maximum static friction force and sliding friction force. These surfaces can be as slippery as a wet and lubricious roadway. The surface of duck feathers is microstructured. Water droplets slide jumpily on such surfaces, where the sliding friction force remains constant with increasing velocity of the water droplet. We speculate whether this phenomenon plays a role when ducks, or other waterbirds, glide through the water and shake water off their plumage when they take flight. The results of these investigations, which have been published in the renowned scientific journal Nature Physics, show new fascinating physical properties of liquid drops. Material provided by Max-Plank Institute for Polymer Research.